I am fortunate that through my endeavours to bring Napoleonic archival material into the public domain, that I have developed a very good relationship with many kindred spirits and occasionally receive important leads from their studies. One such is Ian Robertson, who will be known to all as a leading figure in writing on the Peninsular war, whom I am now privileged to consider a friend. Ian contacted me some time ago with a lead, that of all unlikely places, Rice University in Texas had a collection of Peninsular War letters. Intrigued, I investigated and found it to be true that in Fondren Library in MS155 there was indeed a collection of twenty four letters written between 1808 and 1813 covering various less mainstream aspects of the war. Thanks to the help of Mr Lee Pecht, Head of Special Collections at Rice University, I was able to obtain photocopies of the letters and also gained permission to publish them in my series of booklets by courtesy of the Woodson Research Center, Fondren Library, Rice University, Texas. The letters were apparently part of a collection sold at a New York auction house and bought by the University. They are an eclectic bunch, a few of the early ones are returns from the Franco-Spanish army that invaded Portugal under the terms of the Convention of Fontainbeau in 1807-8; this is followed by a fascinating series of reports from Portuguese commanders to the recently installed Marshal Beresford, observing Soults forces near Oporto, soon after his bloody capture of the city in 1809; completed by a further set of engaging letters from Beresfords headquarters in 1811-13 dealing with numerous mundane issues, such as officer transfers, complaints against troops, pay and allowances, leave, a complete survey of the artillery at Elvas etc. 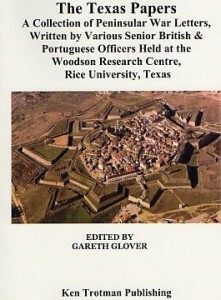 This therefore forms a new and important source for the internal workings and activities undertaken by both regular and irregular Portuguese units during the Peninsular War. Anyone with a particular interest in the Portuguese aspect of the war will find this a must; for all other Peninsular enthusiasts, it will open your eyes to a very neglected part of the overall picture of Wellington s army.